Sweatoflam after a 2.16 mile walk today. It was warm and very humid. And I sweat. 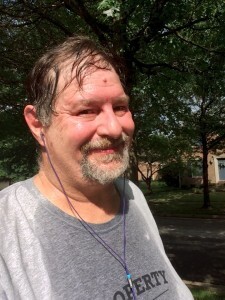 Yes…I am still here and I still have not lost my resolve. Many of my friends (TeamSumoflam) have asked how things are. Best answer for now…stable. 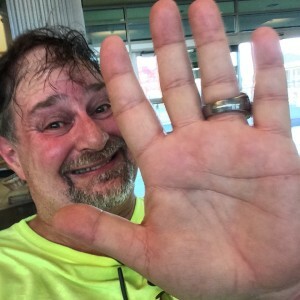 Fortunately, I am still hanging around the 406-410 range despite the two vacations in August (Seattle) and September (Connecticut). Coupled with that is the job since the beginning of August. I had hoped to get under 400 in July, then in August and then by my birthday (Oct. 4). Didn’t do it. But the desire and resolve is there. As many of you know, from April through June I pushed and pushed and pushed. I had great inertia. I lost over 40 pounds (and am still at that). But, then came the new work schedule, the trips, the extra long work hours, the painful heel (result of overdoing it). Though I had promised Julianne that I had not lost my umph, perhaps I had lost some of it after all. The journey is long, arduous and trying. Takes a lot to keep moving forward when there are so many things pulling you in the opposite direction. She tells of her BHAG – Big, Hairy, Audacious Goal (which I call my Downhill Climb). 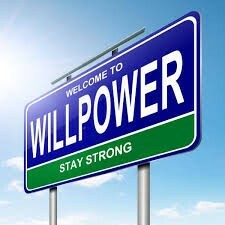 Ultimately, after reading a few other brief articles I have come to realize that is NOT losing UMPH but rather it is running out a renewable resource called “willpower!” Yes, that thing that we all supposedly have. But it never dawned on me that willpower can run out on any given day. This really got to me. So true. How can I count on willpower after working an 18 hour day and gave it my all? How can I count on willpower to keep pushing when I have drained it in dealing with life’s stresses? Part of the successes that both Julianne and I experienced were the result of good planning. We prepared salads and made juice, etc., and had things to take to work. We did these when we had the energy on a Sunday evening. On those days when we both have worked hard and had nothing prepared, it is so easy to just go to a restaurant and grab something to eat. Willpower is Like a Piggy Bank – Willpower is in limited supply. It needs to be budgeted. Willpower is Like a Muscle – Setting small, incremental goals that you regularly meet is the best way to boost your willpower. Much like with your body, if you overdo it by taking on a bigger challenge than you’re ready for, you won’t get stronger. You’ll just be sore. Your Feelings Affect Your Willpower – AHA!! A hard day at work can limit your ability to meet goals later in the day. It’s not just feelings that affect willpower. Anything that involves a lot of thinking and decision-making will make you more vulnerable to temptation later on. You Need More Than Willpower -Willpower matters, but you’ll also need other strategies to help you keep on track.By its very nature, willpower is something that comes and goes. And it can be gone when you need it most. Willpower is a Renewable Resource – You’re human. Just like everyone else, there will be times your willpower runs out. But it is possible to restore your supply.Take time out for yourself as a way to recharge your willpower batteries. The recent spate of Willpower-centric items that have come across my computer screen has given me new resolve. Perhaps I better understand what I didn’t on the earlier parts of this journey. Let’s throw a little willpower spice into the downhill climb soup! I am still going to do this thing. I must learn how to budget my willpower, prepare for the weak days (or the long football Fridays) or other times. Great to have a new refreshing mindset. Back to my friend Rob Roy – “Dig down deep, grab hold and push it out” – from The Navy SEAL Art of War. Congratulations on your determination to take off the weight! I started my journey in early October after hitting 100 lbs over. As of today I’ve lost 32 pounds using a plan I put together from a ton of research. I no longer have heavy cravings on this plan, have lost lots of inches and haven’t needed to do a ton of exercise. My guess is you may have some of the same challenges that I did, where you feel like your body is fighting you all the way home. I’m offering my plan for free and we now have a robust group doing my plan with amazing results. Anyway, thought I’d pass it along. Just subscribe to my blog at mybrightlines.com and check out the plan.